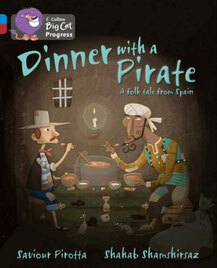 Dinner with a Pirate is a folk tale from Spain and dates back to the time of King Ferdinand and Queen Isabella. It's a story of respect and admiration across cultures. Pedro the fisherman loves sharing his catch with people less fortunate than himself. No one in the village approves when he decides to share a swordfish dinner with a prisoner in jail. But, years later, when Pedro is captured by pirates, he finds his generosity has not been forgotten.